NU-Tech is a completely proprietary, powerful DSP platform to validate and real-time debug complex algorithms, simply relying on a common PC. NU-Tech has been entirely developed by Leaff and is, since its early versions, always under constant development and upgrade trying to fill the various needs of customers and projects specifications. NU-Tech is already been used by a growing community including many partners in the different research projects Leaff is involved in. 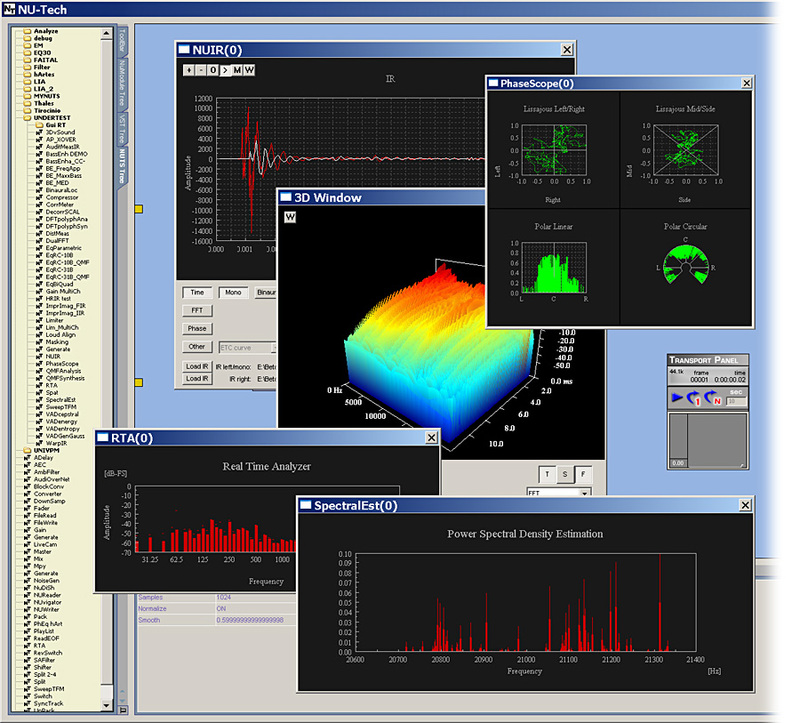 NU-Tech is a powerful DSP platform to validate and real-time debug complex algorithms, simply relying on a common PC. Thanks to an easy plug-in architecture, the developer can write his own NUTSs (NU-Tech Satellites) in C++ and immediately plug them into the graphical interface design environment. A low-level ASIO 2.2 interface allows minimum and repeatable latencies, fully exploiting compatible sound-cards hardware resources. "Distributed" A/V streaming over the network: a proprietary algorithm allows full synchronization between streams on different PCs. NU-Tech is freeware for non-commercial use. A powerful set of APIs can be used to control NUTS graphs and perform complex tasks. NU-Modules provide a straightforward solution to build stand-alone applications or drive automated procedures. VST plugins installed on your PC can seamlessly coexist with NUTS' on the board. Complicated GUI's can be easily managed using NU-Tech framework and its NUModule architecture. Each graphic control is bound to the NUTSs variables handled by the underneath platform. GUI and algorithms are separately developed and maintained. A set of high level functions, makes easier and faster the development of an application from scratch.